Rice Lake SURVIVOR PT Series truck scale is available in many standard sizes to satisfy varying requirements. We understand that pit-type installations often involve replacing an existing mechanical or electronic scale. With a 42-inch profile, (pier to top of approach) the PT easily fits into many existing pits. The Rice Lake Weighing Systems PT Series truck scale is available in many standard sizes to satisfy varying requirements. We understand that pit-type installations often involve replacing an existing mechanical or electronic scale. With a 42-inch profile, (pier to top of approach) the PT easily fits into many existing pit-type foundations. 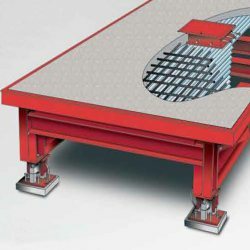 Standard widths for the PT Series concrete or steel deck models range from 10 to 14 feet, NTEP Certified. 51350 Truck Scale,Pit 100x10 100 Ton SR10010-PC-100 CLC=90,000lb Concrete Deck.